im Bennett started out on the other side of safety — he saw the aftermath of unsafe practices in his 22 years as a firefighter for the City of Spruce Grove in Alberta. Being in charge of dangerous goods response, he saw his fair share of train derailments, tanker car rollovers and refinery explosions. This experience inspired him to get in front of the issues before they arise. He became a safety codes officer with the fire department, which had him doing inspections and more proactive work. 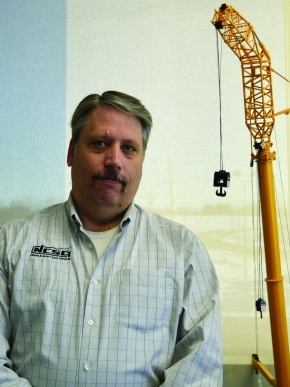 He then launched his occupational health and safety career, and he is now the vice-president of health, safety and environment, technical training and quality, at NCSG Crane and Heavy Haul Services in Stony Plain, Alta., which aligns with his role as chair of the Canadian Hoisting & Rigging Safety Council (CHRSC), which he took on in October. The council was formed in 2011 to work with regulators, industry and suppliers to harmonize hoisting and rigging standards across Canada. The council is made up of 23 volunteers from across the country who bring different jurisdictions together to establish common goals, standards and credentials for cranes and rigs. Previously, there was no group or body that spoke on behalf of the industry from a national level; there were just a few provincial crane owners groups. “There was nothing that pulled everyone together. So when the federal government said ‘Who can we talk to on harmonization?’ before the council existed, there was no one. They didn’t know who to engage, they didn’t have one common voice, they didn’t have a central point,” says Bennett. Bennett’s 12 years of experience on the Alberta government’s Occupational Health & Safety Council bodes well for the CHRSC since he has many contacts in the government and knows how to navigate the politics. The OHS Council is responsible for developing the Alberta OHS Code and it is the quasi-judicial tribunal for appeals of orders issued by the government. Last August, the CHRSC published a document with the Standards Council of Canada outlining the different regulations and standards that various jurisdictions are using. This document was key in helping the CHRSC identify the gaps in harmonization. For example, while workers may have their red seal badge, which should allow them to work anywhere, “that dream never came true,” says Bennett, and different provinces require different experience or education above and beyond that certification. The CHRSC is working with the Canadian Council of Directors of Apprenticeship’s Harmonization Task Force to harmonize the hiring requirements across Canada for crane operators. One of the biggest issues with the lack of harmonization is labour mobility. The crane trade itself is a “dying breed,” so when there is a boom in one province, it frequently needs to source workers from the others — but it has not been easy, says Bennett. The council has been working hard to make labour mobility easier. The first initiative on this front was the British Columbia-Alberta-United States initiative, which allows the provinces to temporarily bring over American crane operators when needed. Credentials, rules and regulations were key concerns throughout these discussions. “How do you engage the same equivalencies? What extra training or assessed training skills, both on the theory side and practical side, are needed to ensure we are not disconnected?” asked Bennett. Labour mobility also calls for increased standardization when it comes to each province’s rules and guidelines. For example, Alberta might allow one practice, but it is prohibited in B.C. This is not only a problem for workers who are used to the rules in their home provinces, but also for employers that operate in more than one province or territory. The council is working on a “multi-jurisdictional viewer” that would map out a crane operator’s credentials across all 13 Canadians jurisdictions so he would know where he can work already and what additional steps he needs to take to work elsewhere. This has been expanded to the U.S. and Ireland as well, to help those workers who may be coming to the country to fill a gap in skilled labour. As part of this, CHRSC is creating a database of all of the mobile and tower cranes across North America — makes, models and manufacturers. It is determining the credentials and training that is required to operate the cranes, then cross referring that information with the applicable standards and regulations. Another big initiative for the council is the qualification and proficiency of rigging personnel. Rigging touches several trades, including ironworkers, pipefitters and boilermakers, and about 25 to 30 industries; however, no province identifies the required training or skills for a rigger — there are just vague, broad terms in the safety codes, says Bennett. “The scary factor is you can have a have pipe layer that’s rigging up equipment to be hoisted or laid into place if they are building a plant or constructing a pipeline or a facility, (but) there’s no standard saying he must be trained on how to attach slings, he needs to understand load capacity, centre of gravity, he needs to understand carry use limitations,” he says. The CHRSC is developing minimum requirements for rigger training and competencies. Once the council has come up with a guideline, it will ask the provinces to consider adopting it in their jurisdictions or, ideally, it would become a national guideline. While harmonization across cranes and rigs will take time, the CHRSC has made some significant headway and Bennett hopes its efforts will have an impact on several fronts. This article originally appeared in the April/May 2015 issue of COS.